The big UFC fights are very popular at the sportsbooks. The fact that there is a big build up with plenty of hype for the big fights and very strong opinions on the fight outcome lends itself well to betting. Not to mention the fights are a lot more fun to watch with some action. On this page I’ve recommended 3 popular betting sites for Americans, looked at the various bets you can make on a UFC fight and provided a simple 3 step guide you can follow to get your UFC bets placed from anywhere in the USA. 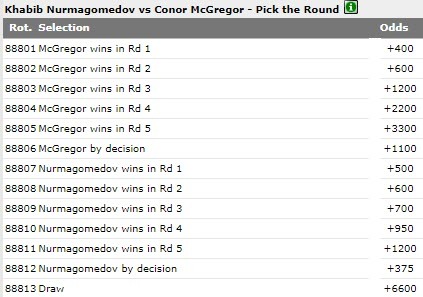 I’ve used odds from the Khabib vs McGregor fight for all of the betting examples below. If you live in the USA and want to bet on Khabib or McGregor check out our how to bet guide for Americans here. These three betting sites take bets on every UFC fight and often offer a variety of prop bets closer to the fights. Each site is popular among American bettors with each of these three sportsbooks primarily focused on the United States betting market. This results in bet offerings, deposit/withdrawal options, promotions and customer service catered towards US residents. Alabama, Alaska, Arizona, Arkansas, California, Colorado, Connecticut, Florida, Georgia, Hawaii, Idaho, Illinois, Indiana, Iowa, Kansas, Kentucky, Louisiana, Maine, Massachusetts, Michigan, Minnesota, Mississippi, Missouri, Montana, Nebraska, New Hampshire, New Mexico, North Carolina, North Dakota, Ohio, Oklahoma, Oregon, Pennsylvania, Rhode Island, South Carolina, South Dakota, Tennessee, Texas, Utah, Vermont, Virginia, Washington, West Virginia, Wisconsin, Wyoming. If you live in Delaware, Maryland, New York, New Jersey or Nevada, then I suggest joining BetOnline.ag, which doesn’t restrict any states. There are a variety of different bets you can make on a UFC fight. The most obvious is simply wagering on who wins the fight, but you can also bet on total rounds, method of victory, round betting and more. Below I will look at some of these betting options with example screenshots from BetOnline. The simplest and most popular UFC bet is wagering on which fighter will have his hand raised after the fight. It doesn’t matter if the fighter wins by decision, KO, submission or DQ. So long as your fighter wins then your bet wins. In this example, Khabib is the favorite with odds of -167. This means you must bet $167 on Khabib to win $100. Conor is the underdog at odds of +147. Every $100 you bet on Conor would win $147 if he pulled off the upset. Check out our betting odds explained page if you don’t know how to read the odds. The second most popular UFC bet is the over/under on how long the fight lasts. In this example the over/under for total rounds is set at 2.5. The over bet would payout if the fight lasts past the 2 minute and 30 second mark of round 3. The under bet would win if either McGregor or Khabib finished the fight in the first two rounds or within the first half of the third. If you think you know how the fight will end then the method of victory prop is for you. A fight can end via a TKO/KO, submission, decision or DQ win for either fighter. The DQ is often combined with the TKO and KO in the method of victory props, like above. The seventh possibility is a draw. If you think Khabib is going to get a late submission after grinding out Conor for a few rounds then you can bet on Khabib via submission at odds of +250. The odds provide a much better payout than wagering on Khabib to win straight up. If you think you know exactly when the fight will finish then you can wager on which fighter will win and in which round. If you think Conor withstands Khabib’s pressure in round 1 and comes out and gets the KO in round 2, similar to the Chad Mendes fight, then you can bet on McGregor to win in round 2 at odds of +600. Follow these three steps to get your UFC bets placed from anywhere in the United States. Choose one of the betting sites outlined above and open an account. I’m going to use BetOnline for this guide because they accept players from everywhere in the US. Click here to visit BetOnline.ag. Fill out the short form on the homepage to open your account. Next you will have to fund your account with the money you want to bet. Go to the ‘Cashier’ or ‘Deposit’ section of the site, choose one of the deposit methods (credit card, bitcoin, e-wallets, etc) and follow the instructions to make your deposit. 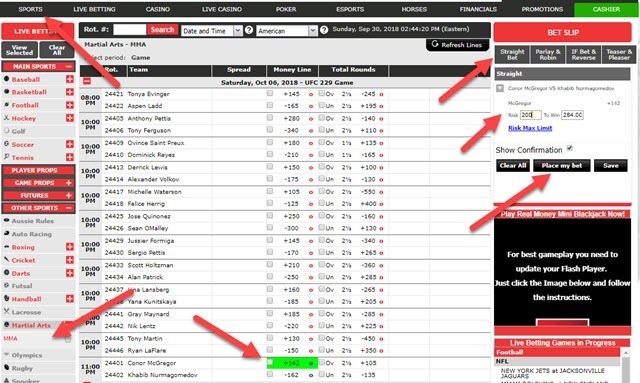 At BetOnline you will find the UFC betting odds by opening up the ‘Other Sports’ drop down menu in the left sidebar of the sportsbook and selecting ‘Martial Arts’. Find the bet you want to make, click ‘Straight Bet’ under the ‘Bet Slip’, enter your wager amount and click ‘Place my bet’. Ready to get started? Click here to visit BetOnline.ag.